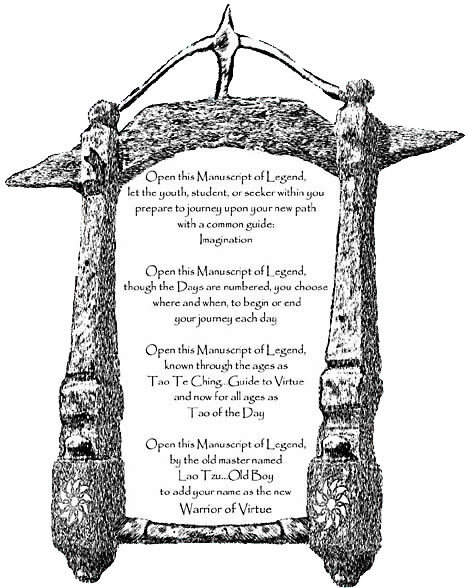 I wrote and illustrated "Tao of the Day" for the MGM movie "Warriors of Virtue" in which it is referred to as "the Manuscript of Legend." My intention was to create a translation of the Tao Te Ching for ages 10 and older in rhyme form and fully illustrated. I believe that children can understand philosophical concepts more fully than adults much in the same way they better understand languages at an early age. Why else was the original author Lao Tzu called, "Old Boy"? Each week (New Day) I will reveal a new chapter of this completed translation. Days 1-81 match the corresponding chapters of the Tao Te Ching.